We think you'll like the 2009 Hyundai Sonata if you're looking for a comfortable, roomy mid-size sedan that won't break the budget. The Sonata continues to offer almost as much as the competition at a lower price. Reliable, comfortable and good- looking car. 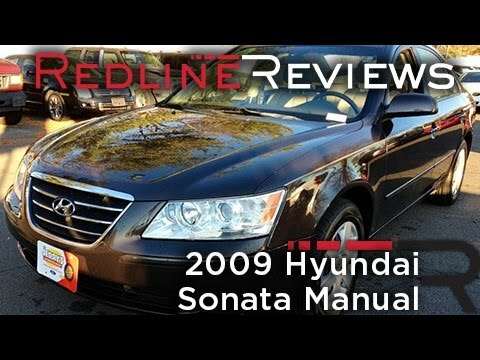 Our 2009 Hyundai Sonata is a comfortable and reliable car. It is a good looking car for which we've received many compliments. It is roomy inside and passengers in the backseat have room for their legs. The trunk is large. We've had very little trouble with it. Problems (very few) are these: the paint. A little spot on each side in front of the rear wheel about an inch square appeared when it was still under warranty and I asked the Hyundai serviceman where we regularly had it serviced (we've moved since then) what to do about it. He suggested using fingernail polish on it. (which I never did). Some time later, after a fender bender, the car was at a body shop and I asked about it. The body shop person said it was a flaw in the paint job that is common on Sonatas. But by the time I heard that, the car was out of warranty, so I did nothing about it. Another problem that we found even as we were buying the car was a problem that all the sedans in our price range had at that time. That is that the headrest both in the front and back seats are very uncomfortable. The front seat headrest pushes the person's head forward, and is not adjustable in any way to compensate for that. This seems like a design that would cause serious injury to a person's neck in a head-on accident, especially for a tall person. The one thing we found that we did do for this horrible problem (that all the makes of cars had) is that we turned it around. However, the headrests in the back seat are also terribly uncomfortable (I am 5'8" tall) for my height. The back seat headrests also push the passenger's head forward uncomfortably and yet there is no way to change that in the rear seat. The rear seat headrest does move up and down but not enough to compensate for the way it pushes the top of the passenger's head forward. A few times, we have had an elderly friend with us in the car and would let her have the front passenger's seat. And if I had to sit in the back seat for a half hour drive, I would get a headache from the badly designed headrest. Travelling or moving? This car can pack it all in! The car has lots of great features such as cruise control, CD player, and plugins for auxiliary and usb. The cruise control worked perfectly, but recently after about 9 years the buttons have started to stick and it is difficult to turn on and set speed. The seats in the car are comfortable even for a larger person like myself. It gets great gas mileage in town and on the highway. It has been reliable for me and has made a number of cross-country trips. Since owning the vehicle, I have continually done maintenance and found that as long as I have work done regularly, then there are not any issues. The paint job on the car is also mesmerizing. That silver color that has faded over time leaves an impression of wealth but still allows me to exhibit some humility when among my less than elite peers. It truly is a chariot of the gods. When reclined, the front seats make for solid beds and I have spent nights sleeping in the car comfortably when going on impromptu travels. Also, the amount of space in the back seat and trunk is impressive. When moving to new apartments, I have always been amazed with how much I can fit once the back seats are folded down. I think one time I fit a bookshelf, my TV, my computer, gaming consoles, 2 bins of clothing, several pairs of shoes, medium sized kitchen appliances, bedding for my king-size mattress, and other odds and ends. What a great car! Upkeep of my Hyundai Sonata. The thing I love most about my car is that it is reliable. I have had to drive my car from Indiana to Iowa a lot during college, since I was going to school in Iowa but I am from Indiana. My car currently has a little over 100, 000 miles on it and I have had it since 2013. The only thing I have had to replace on it we're tires and a starter. It does not have many features compared to today's cars, and it still rides really good given the mileage. It makes a hissing sound every now and then again, but I think something could've been stuck on one of the belts. It does jerk at 20mph in the cold when braking, which I am trying to get fixed. But other than that, the car is very reliable, especially for long distances.